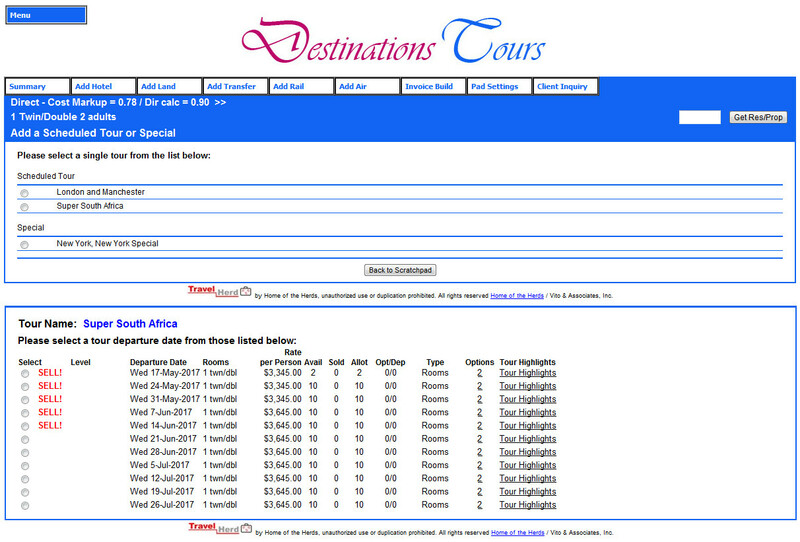 Book scheduled tours and specials with pre-set itineraries, pricing and inventory in TravelHerd. Reservations staff can book scheduled tours and specials, including options and extensions, with pre-set itineraries, pricing and inventory from your TravelHerd database with one click ease and boost your reservations! Scheduled tours and specials are booked, in either scratchpad or reservations, using TravelHerd’s FIT booking engine in the same manner as booking FIT items. When reservations staff book scheduled tours, TravelHerd brings the entire tour itinerary and pricing, including any options and/or extensions which have been selected, into the scratchpad or reservation which they are working in. These scheduled tours and specials may also have single or multi level itineraries and pricing, unique deposit and final payment requirements, and terms and conditions from the company standards or they can default to the company standard requirements, terms and conditions. For tour operators whose primary business is selling pre-packaged tours, TravelHerd offers an ideal way for their reservations staff to quickly book scheduled tours without having to assemble itineraries from separate database components. With one click, the tour is booked, with its complete itinerary and pricing, and the tour departure’s inventory is debited at the same time. 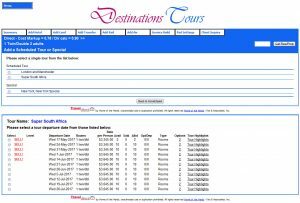 Scheduled tours can also include options, pre- post- or within the tour’s itinerary, which reservations can offer to clients, at extra cost, when booking the tour and increase the total sale. For tour operators whose business is primarily more complex FITs but who also offer scheduled tours and specials, being able to book scheduled tours and specials with pre-set itineraries, pricing and inventory represents a quick way to book scheduled tours, including those with pre- and post- extensions and within-tour options, and increase your sales and profits. Booking scheduled tours and specials is also an extremely useful way for newer, less-experienced reservation staff quickly make reservations while gaining important product knowledge and contributing to your company’s sales.